Woken by bright sunlight at 5am, so got up and out to have first bite of the cherry before any of the others or their visiting mates could spoil the party. Selfish? Well, maybe, but as BT, rarity finder extraordinaire in Shetland once said to me, you’ve gotta be in it to win it. Of course, I won nothing as such, being as I didn’t find an earth-shattering rare, but nevertheless a good start to the day. 4 hours of doing the patch throughly turned up a selection of common migrants, including noticeably more Willow Warblers and hirundines than yesterday, and a 300% increase in Red-backed Shrikes – 3 males all visible at once from the road, each with it’s own mini-territory of fence and field. A great start to the day for me, but possibly not for the patch’s bumblebees. Weirdly, no Spotted Flycatchers, but 3 Whinchats including a well-marked male, the Marsh Warbler for it’s third day, and another acro (same one as yesterday, I think) that continued to defy identification, being a terrible lurker until flushed, at which point it would fly fast and direct to deeper cover. Spent a frustrating half hour trying to be patient and see it without pushing it, and then a completely pointless 15 minutes of being more direct, resulting in it spanging between a croft garden and the plantation, and back again… Gave up, and came inside to work. (With an enduring good feeling about the prospects for the rest of the day). 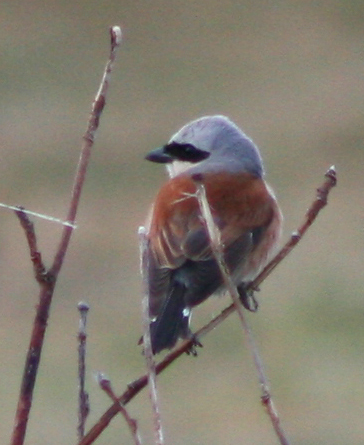 Almost forgot – I even walked around the golf course lured by dreams of Black-eared Wheatears. 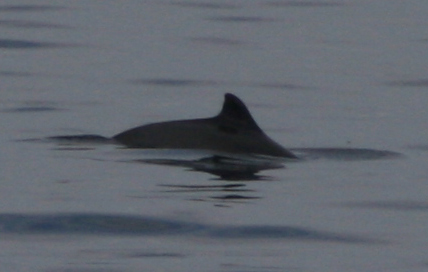 Of course that was silly and unlikely, but it was nice to see Harbour Porpoises feeding close inshore. And fnally, just found this one lurking on the CF card. 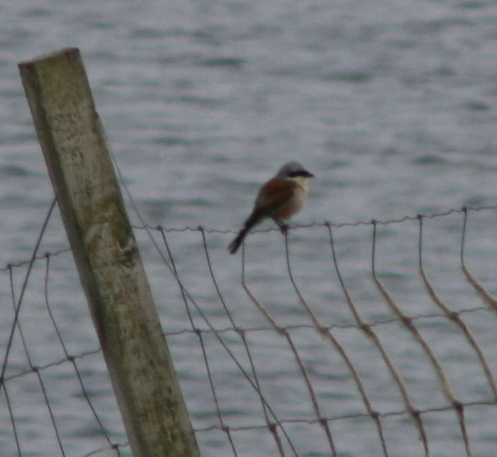 Not a good one, but you get the picture – fences, shrikes… It’s a good place to be birding. Jealous of your R-bSs. I really fancied my chances for one yesterday – maybe tomorrow. Marsh Warbler is a total bogey for me. Heared one once in France – I feel a twitch in the offing, I think there’s one at South Gare.